If you want to learn more about RV’s, then you should become familiar with some of the most common terms people use when they talk about RV’s. People interested in buying RV’s will find these terms in their research before they make a decision. And if you go to an RV dealer’s location, they will throw these terms out at you. So it’s good for you to understand. Consider these five RV terms that will help you learn more. Awnings are some of the most popular features on newer RV’s. You can use an awning when you want to sit outside while enjoying the shade. Awnings come in many different sizes and styles for different RV’s. And you can use them in different modes of operation. You could roll out the awning on your own, or you can press a button to use the awning. It all depends on the specific function of the awning that was installed by the original manufacturer. Some newer awnings even have curtains that will guard you against bugs and wind. The blackwater tank holds all the human body waste from the toilet. When it’s full, it needs to be emptied completely in order to avoid trouble later. If an RV owner doesn’t regularly empty the blackwater tank, it will create a terrible situation that costs thousands of dollars to fix. RV drivers can find dumping stations in campgrounds for convenience. The gravity fill is a fascinating part of the RV. The kids get a kick out of it. It’s a hose that pushes fresh water into the RV’s fresh water tank using only gravity. Because of the nature of the hose, more water often makes it into the tank than what is intended. But it’s a great idea to use the gravity fill before you go camping in an area with no sewerage, water, and electricity hookups. When you park the RV somewhere, the vehicle needs to be level. That’s where leveling jacks come in handy. Newer RV’s have automatic leveling jacks that can be controlled by pressing a button. The leveling jacks then extend and make the RV level on the ground where it sits. It’s very important that the leveling jacks work correctly on any RV you might buy. People in colder climates must winterize their RV. This means that all water should be drained from hoses before cold weather sets in. You could add anti-freezes that don’t have toxic chemicals to the tanks. Or you can flush the water out with air compressors. The important thing is to remove water so that it doesn’t freeze inside the tanks in the winter. 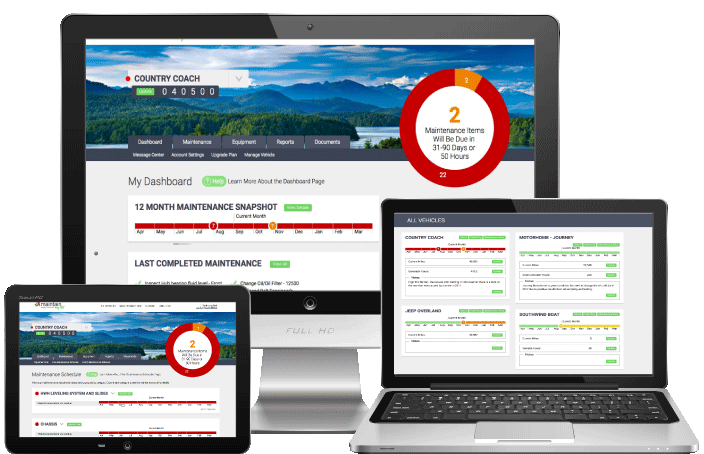 If you want to keep on top of all your important RV maintenance then you need to signup for your free 30-day subscription here at Maintain My RV, it’s easy and simple to get started today!